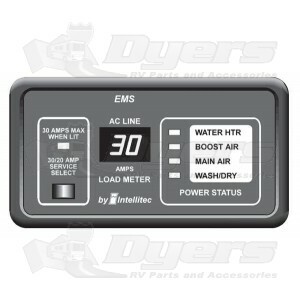 The 30 Ampere Smart EMS consists of two elements, the display panel and the distribution panel. The display panel is wall mounted or on any suitable surface remotely from the distribution panel and convenient for the user. The distribution panel is a completely self contained 120 Volt power distribution and energy management system and is intended to be used in recreational vehicles. The distribution panel is housed in a sheet metal enclosure with removable front panel. It provides circuit protection for all the 120 Volt AC loads in an RV and a system of energy management to minimize the over loading and tripping of circuit breakers.